We are sad to see one of our super Customer Service Executive, Bronwyne, leaving Singapore. Let her take you through her journey since she first joined MetaSport and see if you would like to join the exciting life of Event Management. Why did you join MetaSport? I first joined MetaSport Club when I moved to Singapore in December 2016, so that I could meet other people that had a love for triathlon. Having emailed a few Tri Clubs in Singapore, MetaSport was the club that just made me feel welcome before my first training session. After being a member for only 3 months, I was fortunate to have been asked to interview for the Customer Service position in the office. Fast forward 20 months, and I would not have changed a thing! Working for a company that has so much passion, drive and love for organising world-class events is really inspiring! We are looking for someone to step into your Customer Service shoes. What are the essential skills required, best parts & most challenging parts of the job? Before anything, the person wanting to apply for the position must be passionate about events and working with people! Essential Skills: Being organised is a must! Often more than one event is open for registrations, so you will need to be on top of your game with what is happening with each event. Best parts: Meeting all sorts of people! Although the same events occur each year, it is the people that make it special and unique. Without our loyal participants, our events would not be possible and our drive to improve on them each year would not be there. Most Challenging parts: Leaving! MetaSport has not only been my job, it has been a big part of my life here in Singapore. Other than that, for me, the most challenging part about the job is coming to terms with the fact that I cannot please everyone. Having between 1000 and 3000 participants at an event, there are bound to be some unhappy people. So refocusing on the majority of the happy ones was my challenge. How has your perspective changed now when you take part in events? were people around me happy with the drinks provided, etc. Always looking at ways and ideas to bring back to the team to help improve our events. What is your favourite MetaSport event? 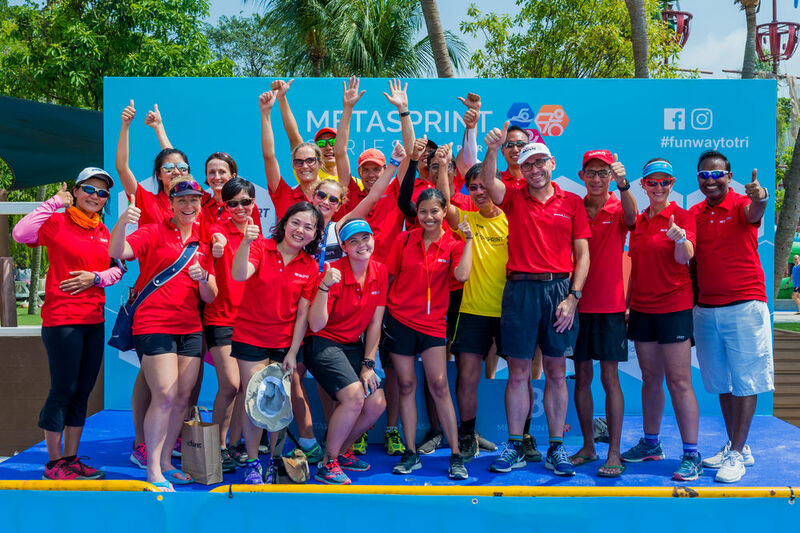 This is difficult question to answer, but an event that will hold a special place in my heart is Tour de Bintan – because that was my first event working with MetaSport. I learned so much during that weekend, and have loved working in Bintan ever since. Are there any specific people or events that you have fond memories of? Definitely! I have been fortunate to have met and made friends with many of the MetaSport participants. One in particular is Willie Teo. He is a participant from the MetaSprint Series and I was invited to his wedding earlier this year. What an unforgettable experience! In a few weeks you will be leaving Singapore for a new adventure. What will you miss most about Singapore? With moving to the UK, I will sure miss this weather! Other than that, I will also miss the ease and convenience of things, with just a touch of an icon, like Redmart delivery. Keen on the role of Customer Service Executive at MetaSport? Email your CV/resume to recruit@metasport.com now.